Ships within 14 business days. Please allow up to 3 additional week transit time for your item to arrive. Why go simple for a bar table when you can invest in a piece that's sure to get people talking? An industrial stunner, this bar table is a rhapsody of rich wood tones that play beautifully off bistro-style cast iron legs. The simplicity and sturdiness of steel give this piece an antique feel, while the warmth of the reclaimed wood tones keep it from feeling cold. 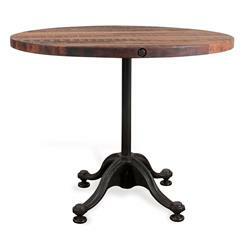 Perfect for a loft space or a bar area in a large living room, this table's practically begging to play host to a series of vintage decanters and fine wines. Enjoy a one year warranty on this piece.